Chonnam National University (CNU) has reorganized its undergraduate liberal arts curriculum 2019-2022 in order to offer students the flexibility to choose courses that will enhance students’ learning and critical thinking abilities. However, this curriculum revision caused many students to experience difficulties when booking and registering for courses that they want to take for this semester. 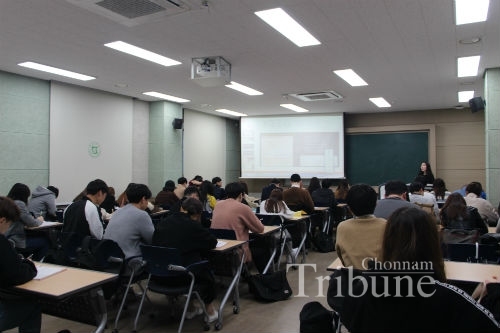 The Chonnam Tribune looked into the core framework of the revised curriculum and examined measures to solve the problems that students faced during the course registration period in this article. Liberal arts courses have been revised; Existing liberal arts courses have been divided into three categories of ‘Core’, ‘Basic’, and ‘General’ liberal arts have been reorganized into ‘Competence’, ‘Basic’, and ‘Balance’ liberal arts. 38 existing liberal arts courses have been abolished, 43 new liberal arts ones have been created. The names of 37 liberal arts courses have been changed. Three curriculum completion rules including a cross-disciplinary completion rule have also been amended. A mandatory course ‘Global Communication English’ has been abolished, and another required course ‘Career Planning and Self-awareness’ has been designated as an elective course. Students who major in natural science or engineering must complete at least three credits in the area of ‘Humans and Society’. Except for them, other students must complete at least three credits in the area of ‘Nature and Technology’. What caused the difficulties? Students answered that they had not received adequate information and the university should have provided sufficient and detailed information to guide the reorganized curriculum before course registration. Regarding this problem, staff members of the CGE and the Office of Academic Affairs (OAA) said that they posted detailed content about the reorganization of the liberal arts curriculum on the CGE’s website and released a notification on the official website of the university. They also informed students about the new liberal arts courses at orientations for freshmen. Some departments also posted the notification about the curriculum change. However, many students do not visit these websites often. The freshmen orientation is literally only for freshmen and not for all students from sophomores to seniors. As a result, many students were not informed about the revision and the changed categories and names of liberal arts courses. The promotion period was also too short. The OAA notified the students about the changes of the curriculum on CNU’s official website on January 28. The period for booking classes that students want to take, however, was from February 1 to 7. It means that the promotion about the reorganization had been held just four days before the course booking period. It was not enough time to let students know about the reformation of the liberal arts course. Thus, many students who did not recognize the change had no choice but to experience frustrating and inconvenient troubles in booking and registering for the courses that students wanted to take this semester. There was a big change in the liberal arts curriculum of CNU. Professors and staff members were concerned about the revision and had been prepared for it through a long preparatory period and the final revision plan was decided last November. Unlike the preparation, however, there was not proper and sufficient effort to inform students about it in advance before the course registration period. Therefore, many students experienced confusion and difficulties while they registered for classes. Jung Su-bin (Sophomore, Division of Animal Science) said “I could not know about the revision well because I did not get any notification or information during the school year. Therefore, I think it would be much better to notify students about the reorganization during the school year next time to avoid students’ confusion.” The CGE official mentioned that they have been considering many useful ways to provide information about the revision and to promote it in order to prevent this kind of problem next time. Having all abovementioned coverage and interview results, if students were informed by a personal phone call or email, it would be much better to notify them about the reformation of liberal arts courses. They would not have difficulties during the course registration period like they had last February. They did not visit the official websites of the university without any particular reason, but they would try to check the information about their curriculum revision released by sending a text message or e-mail and using a push notification service of the ‘CNU Alimi’ application. CNU needs to make more effort to inform students and communicate better with them about the changes in the curriculum or regulations. Its authorities should try to make sure something like this never happens again.